"You Are Doomed to Die, Foster King"
"Old Ironnerve, As I live!" The Mysterious Cabinet and the "Ghost"
"You're First Victim, Old Ironnerve"
“How long has he been your cashier?” asked Old Ironnerve, as he made a mental note of the apparent freedom with which Banker Butterfield referred to the particulars of the case. The Central-Midland Bank of New York had been for years considered one of the most conservative and skill-fully managed banking institutions in the city, and now, for the first time in its history, a dark shadow had fallen over the usually brilliant pathway of the directors, for they had suddenly made the startling discovery that they were being systematically robbed of their funds. President Butterfield, who was himself an expert accountant, having served many years at the desk as a clerk before successful ventures in Wall Street had placed him among the leading capitalists of the city, had made the surprising discovery. A number of entries had been made upon the ledger of the bank, which so altered the balances that more than sixty thousand dollars had been surreptitiously entered upon the debit side of the accounts in order to equalize the trial balance, and it was clear that fraud had been practiced to an extent which an investigation alone could determine. Thoroughly determined to sift the matter to the bottom, the old banker had called upon the famous detective, and requested him to undertake the unraveling of the mystery. “I am glad you will take the case for me “began the banker, as he rubbed his hands warmly together, and his face took on an expression of pleasure while he spoke. “Remember, I only told you that I would think about it,” interrupted Foster, and at the same time bending his piercing gaze fully upon the banker’s face, for be detected a slight start, and for an instant the man’s face grew pale. “But I will pay you well!” exclaimed Butterfield, as he half rose from the chair in which he had previously been sitting. “How did you first discover the books had been tampered with?” asked Old Ironnerve. The detective’s gray eyes twinkled with a strange light, as he leaned back in his chair, and listened to the statement from the excited banker’s lips. For an instant Butterfield paused and bent his head as if in deep thought. “There were twenty-eight thousand dollars in this month’s consignment,” came the reply. Although the banker answered Old Ironnerve’s questions without hesitation, yet Foster fancied that he detected a slight uneasiness in the old man’s manner as he spoke. For the first time the banker hesitated. Old Ironnerve looked him squarely in the eye. He plainly saw that Butterfield was trying to withhold something from him, and he determined to know just what that something was. “Pray be frank, Mr. Butterfield,” he said in a calm tone. “You cannot expect me to go to work understandingly unless you see fit to give me all the information in your power, for even the slightest thing may add an altogether new phase to the case, from the standpoint from which I am expected to view it. “On Friday night I was called to attend to some matters for an aged widow, a friend of the family’s, and I found her upon her death-bed. I had, some two years previous, taken, on deposit, some securities which she did not dare to intrust to strangers, for fear of losing them. You know how eccentric women are sometimes? Well, I found that she was determined to secure those papers before she died, and, in fact, she told me she wanted to die with them in her hands, and what could I do but go to the bank and get them for her? as I realized that she had but a few hours more to live, and the physician told me that perhaps it would alleviate her mental suffering, and make her last hour easier upon earth. “I jumped into a carriage and drove down-town to the bank, and entering the side door, I went at once to the private vault, where all of my books and accounts were kept. “I opened the door and took out the ledger, for the purpose of ascertaining the exact date upon which she had placed the securities in my hands, as well as to see what was the balance of interest due her upon account. “It chanced that when I opened at the index, my finger turned involuntarily to the name of my Boston friend, and out of pure curiosity I turned to his account first. “I glanced at the balances for the last month, and I could not believe my own eyes, for there, in black and white, were the figures which were supposed to show our exact standing, but I knew that those figures were not correct, and that some blunder had been made. “I hardly knew what to do. I turned from the page, and before I could find the name of the dying widow I became thoroughly puzzled over what I had seen at a glance. “Again I turned to the long account, and once more I was as fully satisfied that some big mistake had been made, for instead of owing him, as I was perfectly confident that I did, some hundred and fifty thousand, I found that I was only owing him, as by that book, about one hundred and five thousand dollars. “Did you investigate at once?” asked Foster. “I did. After returning to the dying widow and pacifying her mind with the securities and accrued interest, I went directly to the bank, and for over four hours I went carefully through the books, although not a sign of an error could I discover. “But suddenly I paused in my search. I know that I came near fainting, for I got so cold that my hands felt like ice to myself. “I stumbled upon a discovery which nearly upset me. Money had been entered directly upon the ledger to balance accounts, and no mention whatever was made of it upon the cash-book. We were being ingeniously and shrewdly swindled. When the aged banker had finished his conversation with Old Ironnerve he rose and left the detective’s house. He appeared in better spirits than when he had arrived at the celebrated man-hunter’s office, and Foster felt that the man’s mind had been relieved by his assurance that an effort would be made to find the source of the alleged fraud. The banker descended the steps, and entered his carriage which had been in waiting at the door. As the vehicle rolled away, Old Ironnerve from a window in the upper hallway, observed a dark form clinging to the baggage frame behind. What did that mean? Was the old banker being shadowed? With a quick movement he reached the door of his den. Snatching a package from the table nearby, he descended the broad stairs three at a bound. Before his feet had struck the lower landing, Foster was well disguised with the articles of apparel that he had hastily snatched from the package, and, opening the door, he sprang into the street, to all appearances a man of fifty years with a full beard and somewhat rheumatic gait. By the merest chance a hack was passing at the moment. It was going in the same direction as the one taken by the banker, and Old Ironnerve quickly hailed it. “Hello, Cabby! Are you after a fare?” he asked. “Yes, I’m at liberty just now,” came the reply, and the driver of the hack quickly drew rein, and turned his horses’s heads toward the curb. Old Ironnerve met him halfway. “I guess I will sit up beside you, for I feel kind of squeamish like, and perhaps the air will do me good,” exclaimed the gray-whiskered old chap, and he climbed upon the box with an agility which seemed to puzzle the driver. “You are pretty nimble for a man of your age,” said the Jehu, and he cracked his whip as the carriage rolled away. “Well, how old do you think I am?” asked Foster. “Well, no, I am not dead yet, by any means,” and Foster tendered the driver a cigar. Accepting with thanks the proffered weed, the genial cabby was quickly impressed with the sporty blood of his fare, and a moment later he had made a remark that caused Old Ironnerve to start. “Do you know old Butterfield, of the Central-Midland Bank?” be asked. “Are you sure he said it was Butterfield?” asked Old Ironnerve, his curiosity aroused. The hack had been for some moments rumbling quietly along over the macadamized street, which at that point was very smooth, and Foster\’s eyes had been riveted upon the dark object in advance, which he knew to be the carriage containing the old banker. Presently the leading vehicle turned abruptly to the right, and entered a broad street upon the east side of the avenue. When Foster’s driver reached the corner, the detective directed him to follow in the wake of the advance carriage, and this he did. They had scarcely turned the corner when Old Ironnerve grasped the hackman’s arm. “Pull up,” he whispered, for scarcely thirty feet away was the vehicle which they had been so quietly shadowing. As the carriage stopped, Foster sprang lightly to the ground. “Wait for me here,” he said, and he started forward toward the spot where the carriage stood, when he was suddenly startled by a wild shout from the driver of the banker’s carriage. “Help! Murder!” came the cry, as the hackman spiang back from the open door of the vehicle, and hastily snatched the side light from its socket. In a moment the famous detective was by his side. “What is the matter here?” asked Foster in a stern voice, as he leaned forward and peered into the semi-darkness of the hack. “Look and see!” exclaimed the trembling driver as he threw the light upon the cushions inside the vehicle. A startling sight met the detective’s gaze. The interior of the carriage was covered with great splashes of blood, and the cushions were piled in confusion upon the body of the aged banker who lay in a heap upon the floor, a wicked looking knife plunged into his breast. His pale, upturned face was contorted with agony, and his half-parted lips presented a frightful spectacle, for they were covered with clots of foaming blood, which still oozed from between his teeth. “My God! What a crime!” gasped the driver, as he surveyed the gory spectacle, and even Old Ironnerve shuddered as he contemplated the scene. The inmates of the house had been aroused by the outcries of the hackman, and at that instant came hastening down the steps. “What is it, sir?” asked a beautiful young woman, as she reached the driver’s side. Old Ironnerve glanced at the questioner, and then he turned and interposed his body between the door of the carriage and her range of vision. “Who are you, sir?” she asked, as she drew proudly back from the grasp of the detective. Old Ironnerve leaned forward and whispered something in the young woman’s ear. She started as though she had been stung. Her eyes flashed like jets of fire as she fixed her gaze upon the detective. The driver heard and comprehended the meaning of her excited words. He little realized that the man who stood by his side was the very man whom he had driven the aged banker to visit, and a look of bewilderment filled his eyes as he glanced at the man whom Annette Butterfield had chosen to style a detective. But Old Ironnerve was not the man to be argued with. He knew that a dark crime had been committed, and that be was at that instant in the presence of death, and so he determined to carry a firm hand with the young woman. “Miss, you will return to the house at once,” he said, almost sternly. But the haughty young woman was fully as determined as he, and she quickly manifested her spirit of firmness. Foster’s words were interrupted at that instant by the mellow voice of an elderly woman who had descended the steps to the young woman’s side. “Annette, you will certainly do as the gentleman requests,” she said, and she grasped the maiden’s arm firmly as she uttered the words. “Why should I go Into the house?” almost whimpered the girl, as Foster turned to survey the newcomer. Old Ironnerve beheld a woman of rare and impressive beauty. She was apparently about fifty years of age, and to all appearances had been at one time a picture of grace and refinement. But the ravages of time had begun to plow furrows of care upon her still handsome brow, and her silvery locks attested the inroads of encroaching years. Her eyes met those of the detective, and for an instant Foster fancied that he saw an involuntary start. She seemed to shrink from him as though she held him in mortal fear, and yet she did not appear to move; the strange contraction of the muscles of her body alone signifying the nature of her emotion. Foster wondered if she knew him, for he did not recall her face, but almost instantly she had regained her self-possession. “What is the trouble, sir?” she asked, as she gently forced the younger woman toward the door of the mansion, and herself stepped closer to the side of the carriage. As the rays of light from the lamp in the hands of the driver fell upon the pale, upturned face of the murdered man within the hack, the lady paused. Her face grew ashy white, and with a loud cry she threw up her hands and plunged forward toward the pavement. “Cyrus! My husband!” she cried, and she would have fallen had not the powerful arms of Old Ironnerve held her up. Foster instantly saw that the woman had fainted, and he quickly beckoned to the second driver to approach. In a moment the cab drew up to the curb, and the driver sprang to the sidewalk. “Has she fainted?” asked the man as he saw the limp form lying in Old Ironnerve’s arms. “Yes, and you will help bear her into the house,” answered Foster. The cabby started, for the voice of his fare had changed from the wheezy tones of a rheumatic old man to those of the well-known man-hunter. 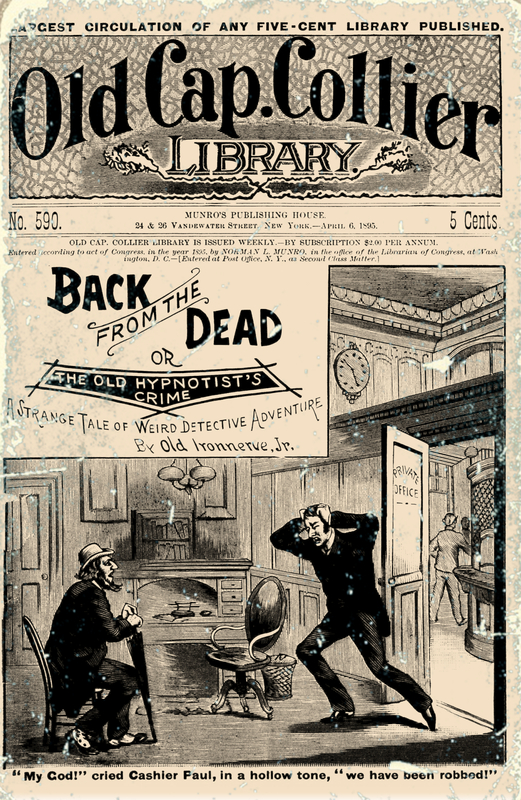 This was indeed true, and when, a moment after the two men had returned from the mansion, having carried the stricken woman into the library, the hackman saw the awful evidences of a crime, he came near yielding to the horrible faintness which such a sight might induce in even the strongest of men. “What does it mean?” he gasped as he gazed at the wonderful detective, and thought how lucky it was that Foster chanced to have hailed him, and ridden directly toward the scene of the crime. “It means murder!” exclaimed the hackman, who had driven the old banker’s carriage, for upon this particular occasion the vehicle in question was not owned by the banker, but was, instead, hired for the trip from his place of business, as was generally the aged millionaire’s custom when he was late in the transaction of some of his various business affairs down-town. “Then some one ought to call the police,” answered the second, but Foster placed a restraining hand upon his arm. As the two hackmen gazed upon the figure of the celebrated sleuth, that individual seemed not to note their presence, but went about his task as though be alone was in the presence of the dead. Foster’s keen eyes took in every phase of the surroundings, and they suddenly lit up with a gleam of satisfaction as he stooped and plucked a shining object from the floor of the hack. “I will find the fiend who struck that blow if it takes the remainder of my days to accomplish the task,” he muttered as he turned and directed one of the cabmen to hasten and find a patrolman. Old Ironnerve little dreamed of the dangers that were in his path, and that the task before him was to prove the most difficult that he had ever undertaken.